This group of marine molluscs includes squid, octopus, cuttlefish and nautilus. The name Cephalopoda, means "head feet". They have bilateral body symmetry, a prominent head, and their foot has been modified into arms or tentacles. There are about 800 living species of cephalopods although new species continue to be found. Cephalopods are found in all of the world's oceans, from the warm water of the tropics to the near freezing water at the poles. They are found at all depths, from hydrothermal vents to the sea surface. Their diversity is greatest near the equator and decreases towards the poles. All Cephalopods have tentacles with suckers which they use to grab and hold their prey, The common octopus has about 240 suction cups per tentacle.. The octopus has eight tentacles whilst Nautilus have more than ninety. The tentacles surround a powerful beak-like mouth. Cephalopods are widely regarded as the most intelligent of all the invertebrates and have well developed senses, complex nervous systems and large brains; larger than the brains of gastropods. Most cephalopods use their sense of sight to detect predators and prey, and to communicate with one another. They can detect gravity, have a variety of chemical sense organs and use their tentacles to explore their environment and to judge distances. Most cephalopods possess chromatophores (coloured pigments) which they can use ito change their appearance very rapidly. Chromatophores are used for disguise, defense, mating, and predation. Each species has a particular series of color and patterns it utilises in any particular situation. Many Cephalopods, especially those living in the deep, bioluminesce, producing a blue-green light. The bioluminescence is produced by pockets of bacteria in their skin; or generated in photophores (light-emitting organs permanently located on the external or internal surfaces of the animal). Bioluminescence has many uses for cephalopods. For many species, it is used to attract mates. It also has camouflaging properties, and can be used to distract enemies when ejected in a light-enhanced cloud of ink. Cephalopods are the only mollusks with a closed circulatory system. They have two gill hearts that transport blood through the capillaries of the gills. A third single heart then pumps the oxygenated blood through the rest of the body. Cephalopods use the pigment hemocyanin, a copper-containing protein, rather than hemoglobin to transport oxygen. This means their blood is colourless when deoxygenated and turns blue when exposed to air. Cephalopods exchange gases with seawater by forcing water through the gills. 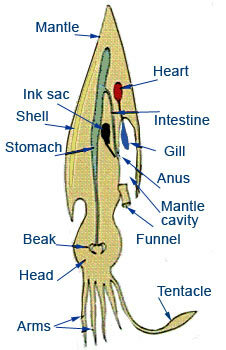 Water enters the mantle cavity on the outside of the gills then the entrance of the mantle cavity closes. When the mantle contracts, water is forced through the gills. The expulsion of water through the funnel can be used for jet propulsion. All Cephalopods have a two-part beak and most have a radula, They feed by capturing prey with their tentacles, drawing it in to their mouth and taking bites from it. They produce toxic digestive juices which they eject from their salivary glands onto their captured prey held in their mouth. These juices separate the flesh of their prey from the bone or shell. Cephalopods use colour changes for courtship. A courting male will approach a likely looking opposite number flashing his brightest colours. If the other cephalopod is female and receptive, her skin will change colour to become pale, and mating will occur. The male has a special arm which he uses to transfers a sperm packet to the female. Cephalopod eggs vary considerably in size, from 1 to 30 mm in diameter. With many species the eggs are cared for by the female. Young do not pass through a larval stage, they quickly learn how to hunt.